Ice cream is one of my favorite food.I don't eat it everyday but I certainly have them every week.Not the on the popsicle stick kind but more of the one you have to scoop kind. 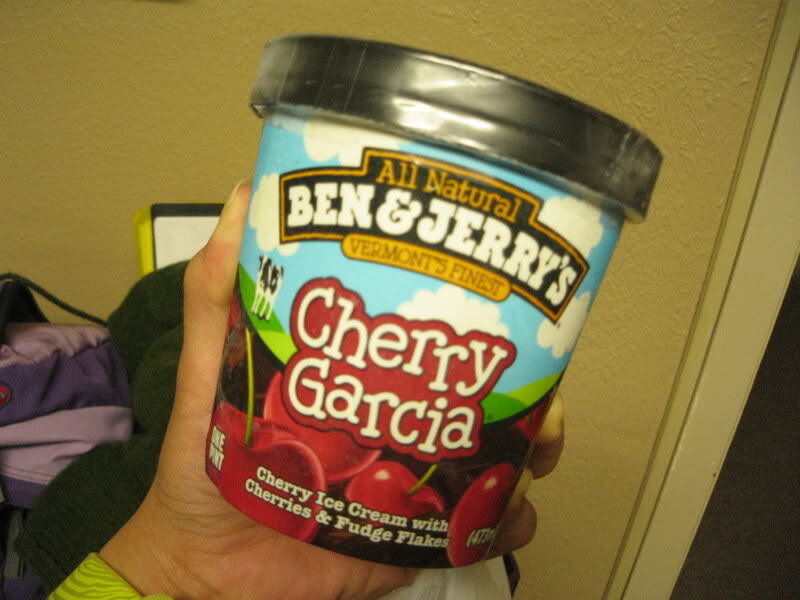 One of my most life changing ice cream eating experience was when I was 15 years old,when I tasted my first spoon of Ben & Jerry's.I think it was the flavor Cherry Garcia. My 2 favorite flavor from Ben & Jerry's are Cherry Garcia & Neapolitan Dynamite.Sadly nowadays,Ben & Jerry's ice cream are hard to come by because unless you live near a Cold Storage(which I don't),you won't be able to buy them.Plus a pint of them is costly. Thus I have to resort to Baskin Robbins which is quite good but they're not Ben & Jerry's.Probably because Ben & Jerry's uses all natural ingredients. 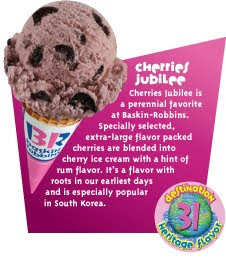 For Baskin Robbins my favorite flavors has got to be Pralines & Cream,Love Potion #31,Winter White Chocolate & Cherries Jubilee. I like the fact that on any bad day or times when I feel like I want a scoop of something creamy and luscious,I can just head over to the nearest Baskin stand and buy a scoop of any of my favorite flavor and everything feels better.Oh how I wish Ben & Jerry's would open their scoop shop(that's what they call it there) right here in Malaysia. Now,if we're talking LOCAL, my favorite ice cream flavor has to got to be---DURIAN!! !Yumaaahhhh.I love durian in any form actually.In doughnuts,in cheesecake,in ice cream,in bubur but nope,I don't eat tempoyak!ahaha.I remembered enjoying that rm1 or is it 1.50 ice cream cone from the ice cream man & I would always tell him to 'nak yg kaler kuning jer'(only the yellow ice cream),which meant more durian ice cream.And believe me,durian & chocolate ice cream together on a wafer cone taste really really good! And of course for uni students with a limited budget,we always head over to Mc Donalds for the chocolate sundae or vanilla cone or choco top or oreo mcflurry. 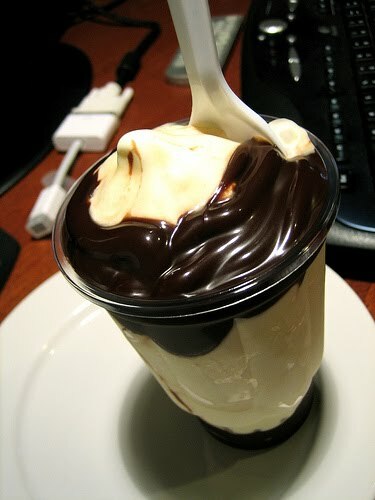 I just had a chocolate sundae yesterday because in my swollen face/mouth condition,it's easier to eat ice cream--yeay!!!ahaha. What are some of your favorite ice cream flavors?